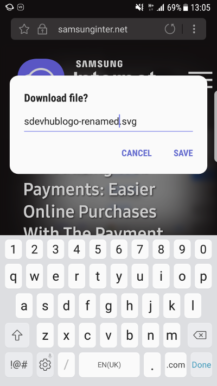 The last major update included a night mode and a tracking blocker, and just before that the addition of smart form filling feature 'Smart Go Next' was announced. There's a beta version which is first to get these improvements, and Samsung has just updated it to version 6.4. Aside from the usual bug fixes, there's just one notable enhancement: a new download manager. Rename prompt, open file prompt, and 'Download History' page. For those who often pull files from the web on their phones, the changes appear to be really handy. First of all, you'll get a prompt to rename every file you download. Then you'll be notified at the bottom of the screen when it's ready to be opened. 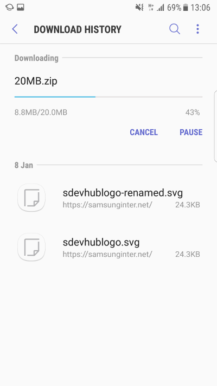 While you wait for larger files to download, there will be a notification showing its progress, where you can also choose to pause downloading if you need to. The UI for the 'Download History' page has also been refreshed. 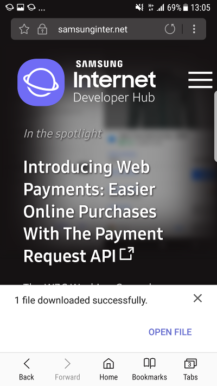 You can get there by tapping on a download notification, and you'll be greeted by the status of that download plus other recent ones in order of date. Downloads can be deleted from the history screen, too, which can also be accessed by navigating to Bookmarks > History > Download History. You can update to version 6.4 and try these new features out right now via the Play Store link below, or sideload it from APKMirror. Help bring any bugs to the attention of the devs by letting them know on the GitHub support page.